After pinning and dreaming and giving myself lots of pep talks, I attempted what seemed like the impossible (to me). My biggest problem with cakes is that I can't start them a couple of weeks in advance and have plenty of time to redo stuff I don't like. With cake - it's all or nothing. I wait until two nights before the party to bake the cakes so they're cooled the day before which makes decorating infinitely easier. The bottom cake was a 2-layer yellow cake as was requested by the birthday boy. The middle cake was a 2-layer homemade vegan chocolate cake (for me mostly but hey, I made it, I needed to be able to enjoy some of it right?). The top cake was a 2-layer Bob's Red Mill gluten free yellow cake mix. The Snickerdoodle had no idea what I had up my sleeve so after staying up late into the night the night before his party, I was eager to show it to him first thing the next morning. When he saw it, he said just what I needed to hear, "Wow Mommy! That's exactly the cake I wanted you to make me!" 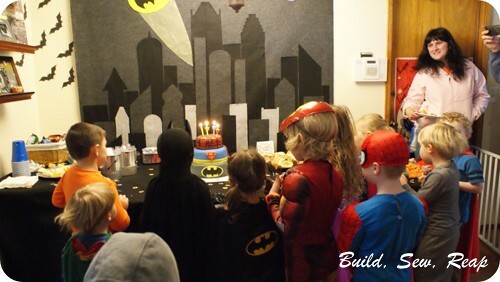 He loved it, as did all his little superhero friends. That is the coolest cake ever! How on earth did you create that? 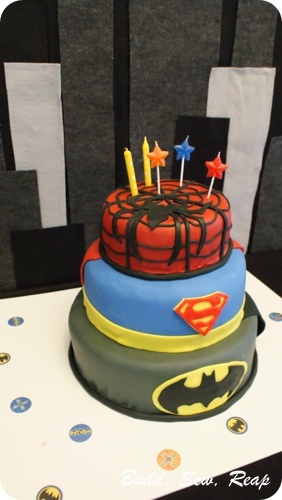 The Spiderman cake looks so complicated and I'm crazy about the cape on the back of the Superman cake. Sooo cool! Did you hand make your fondant? So much work! Thank you Michelle! I ended up buying the fondant. A few of the colors came in a small multipack but most of it was stuff I colored using gel food coloring and white fondant. I used to make my own MMF but have since stopped eating marshmallows since they aren't exactly vegetarian. Anyway, the spiderman layer was just red fondant and then I cut strips of black and stuck it down. I'll admit, that layer took forever but it was worth it. I'm going to do a post about cutting intricate designs out of fondant because I figured out a pretty great trick! I totally love the creativity required when making a cake like this. It is such a challenge that when I finish and take a step back, it feels terrific to see something like this in front of me.